Behavioral Health Resources, LLC was founded in Spring 2011 by Brenda Rohren. Her interest in this endeavor was prompted by requests from several CARF-accredited organizations that were interested in contracting for management consulting to prepare for accreditation re-surveys. Behavioral Health Resources was incorporated as a Limited Liability Company (LLC) in Lincoln, Nebraska on June 8, 2011. In March 2013, business operations were expanded to include Clinical Services. In July 2014, our offices moved to the Corporate Centre office park. In February 2015, services again expanded to include Professional Development, focusing on sponsoring EMDR therapy basic and advanced trainings as well as consultation to EMDR therapists who are pursuing EMDRIA Certification and/or otherwise want to improve their clinical skills as EMDR therapists. For information about Brenda’s credentials, areas of expertise, and employment experience (to include as a CARF surveyor), refer to the Staff section of this website. Strategic Plans. 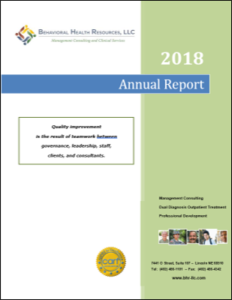 The primary focus of our Strategic Plan for FY 2013 and FY 2014 was to obtain CARF accreditation for our Dual Diagnosis Outpatient Treatment program serving adolescents and adults. This was accomplished in October 2014. Our initial focus in FY 2015 was to obtain licensure in Nebraska as a Substance Abuse Treatment Center. This occurred in March 2015. In FY 2015 and FY 2016, we expanded our business operations to include Professional Development by sponsoring a series of EMDR therapy basic and advanced workshops. Information about these events is published on the Southeast Nebraska EMDRIA Regional Network website at www.sene-emdria.org. In FY 2015, we also became the corporate sponsor for the Regional Network. Our Strategic Plans for FY 2016 and FY 2017 included increasing our focus on providing services to military personnel, veterans, and their families as well as expanding our trauma-informed services for all clients by pursuing a collaborative relationship with a local organization to provide equine-assisted psychotherapy. After consideration, it was determined that offering equine-assisted psychotherapy wasn’t feasible at this time due to lack of Eagala (or other) certified Equine Specialist Professionals in the local area. The Strategic Plans for FY 2018 and FY 2019 included an expanded focus on providing clinical services to first responders. Contracting with a consultant who is familiar with the accreditation process and CARF standards is a cost-effective approach. Our CARF consultants can help improve the effectiveness of your services through continuous quality improvement and to prepare for on-site reviews by using a variety of approaches and options that are individualized to meet the specific needs of your organization. Behavioral Health Resources from Three Pillars Media on Vimeo.